St. Isaac’s Cathedral, currently a St. Petersburg museum. The Russian Orthodox Church would now like to reclaim it. 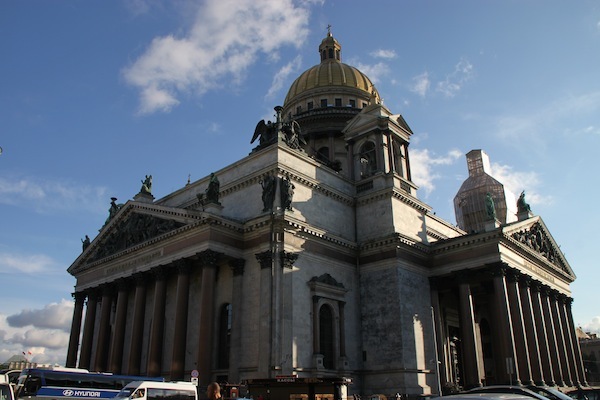 Our third churchly stop was St. Isaac’s Cathedral, the world’s fourth largest domed cathedral. A museum now, it took 40 years to build, 1818 to 1858, and could accommodate 14,000 people for services. I remember it as having a very heavy look and being quite dark when I saw it in 1979. It features what I call heavy architecture, without the light or airy features of, say, the gothic style. The dome on St. Isaac’s Cathedral, the world’s fourth largest domed cathedral. However, it seemed much brighter on my recent visit. I’m not sure what accounted for that — restorations? A faulty memory? Or just bigger lightbulbs? 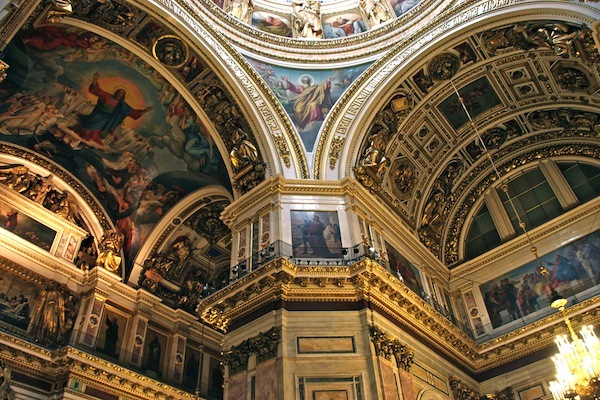 This huge church rated a huge basement, built on 10,000 piles. During the World War II siege, valuables were sheltered in this basement. Sanctuary walls and ceilings were initially covered with frescoes, but “in our climate,” Tanya said, frescoes cannot survive. Most were replaced with mosaics before 1914. The iconostasis, where paintings of saints and green pillars are visible, seen at the front of the St. Isaac’s Cathedral sanctuary. After 1917, St. Isaac’s was an anti-religion museum, then a mineral museum, based on the 30-plus minerals/stones used in its construction. Samples of the stones, mosaics and gold trim that help make St. Isaac’s Cathedral a compelling eyeful for visitors. When the Soviet Union collapsed, the church didn’t reclaim St. Isaac’s because of maintenance costs, but the church, now in better shape financially, is negotiating with the government to recover this property. For now, services are held in one corner. St. Isaac’s also is used for concerts. This article and its photos are by Nadine Godwin, the author of Travia: The Ultimate Book of Travel Trivia, which was published by The Intrepid Traveler. 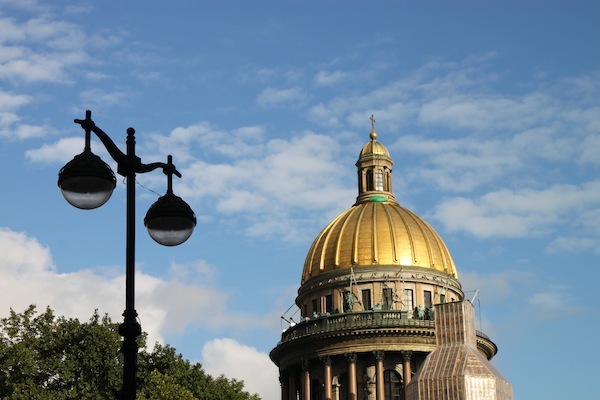 The guide for this trip was Tatiana (Tanya) Svyatodumova, retained by a St. Petersburg travel company called Versa.